Which neatly leads on… I’m gonna recommend the Robbie Robertson book, Testimony, to y’all. It puts proper flesh on the bones of many of the stories that have been told again and again – such as how they sourced a new drummer once Levon Helm bailed on the 65-66 Dylan tour, and why Robertson ended up photographed alongside Alan Ginsberg in front of City Lights bookstore in 1965 – as well as providing a sense of the dizzying nature of their work with Dylan. It’s light on the specifics of his songwriting, the recording process and the evolution of his guitar playing, but strong on portraits of the many characters that cross his path. If you read this alongside Levon’s “Wheels on Fire” and Barney’s “Across The Great Divide” and “Small Town Talk”, you can patch together a story with at least seven different sides, Rashoman-style. Doing this reveals a rounded narrative about the extraordinary series of events that gave birth to The Band, and the clash of Robbie’s voraciously aspirational search for knowledge and status with Levon’s “Hell, let’s just play” mentality that signposted the death of this joyous group even at the moment of its greatest triumph, The Band. I mean, Bunuel and F.S. Walcott’s Medicine Show had much in common but – in the end – not enough. … that Terry Cryer has passed away [Val Wilmer’s Guardian obit here]. I’ve always loved the pictures that he took of Jazz musicians in the 50s. They (and more) were collected in a fascinating book, One in the Eye, edited by Ian Clayton and with a great introduction by Val Wilmer in 1992, which is set to be reprinted soon, apparently. It’s full of deadpan writing, by a man who said, “I broke the rules because it was a lot more fun than following them”. “By the time I got to London, dope was becoming fashionable. People stopped chewing benzedrine inhalers when the company that made them took the Benzedrine out. Pity about that, they were quite nice with lemon gin…”; “Ann and I got married – we were quite happy just living together, but under pressure from Sister Rosetta [Tharpe], I bought a special licence. 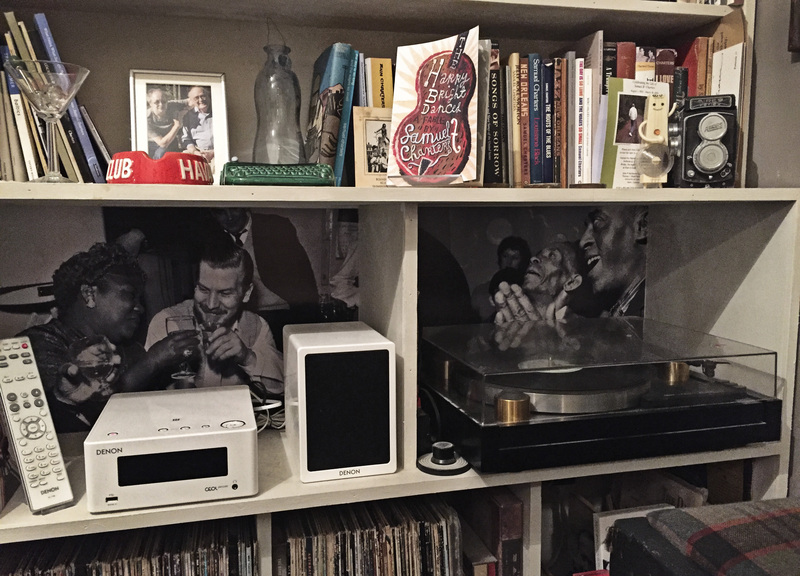 She gave us the best wedding present, a night in the Adelphi Hotel in Liverpool!” I always have a print of one or more of Terry’s photographs wherever we’re living – currently these two grace the wall behind the record deck. My favourite items in the V&A’s You Say You Want a Revolution? Records and Rebels 1966 – 1970 were in a small case (see picture by Lucy Hawes/V&A). They were the messages written on paper plates and scraps of paper and pinned to shelter doors or trees at the Woodstock Festival. You know the kind of thing – Beware of the Brown Acid/I’ll meet you by the right-hand Tower – but touching that someone saved them. Frustratingly hit and miss as a round up of those five years, but hugely enjoyable none the less, it’s on ’til Feb 26. Now let me hear you shout… “Gimme an F! After mentioning Lou Reed’s “Dirty Blvd.” in the synaesthetic wine thing (here) a couple of weeks ago, I spent some time looking for songs that could possibly be covered by an unnamed legendary rock singer as he contemplates a new album. In my trawling I was looking at a couple of songs on Robbie Robertson’s “How to be Clairvoyant”, an album I’d never given the time of day to. It’s really good – my slight antipathy to solo Robbie is breaking down. And that led on to Lang Lang’s take on “Somewhere/Dirty Blvd.” It’s kind of amazing, almost 12 minutes of pianistics, bombastic percussion, “Somewhere” sung by Lisa Fischer, and “Dirty Blvd” spoken by Robertson. It’s on Spotify, although not on YouTube, if that has whetted your appetite. If you’re receiving the e-mailout, please click on the Date Headline of the page for the full 5 Things experience. It will bring you to the site (which allows you to see the Music Player) and all the links will open in another tab or window in your browser. Filed Under: Weekly Roundup Tagged With: Greenwich Village, Lang Lang, Loyle Carner, Music From Big Pink, Music That Defined a Generation, Robbie Robertson, Terry Cryer, Testimony, The Band, Val Wilmer, Yesterday’s Gone, You Say You Want a Revolution?